Valentine's Day offers a special opportunity to show your love through food. This February 14, spoil the object of your affection with a special romantic meal. Some sumptuous seafood dinner ideas—with soups, baked dishes, light meals and classic dinner entrees—are sure to stir your appetites and set the mood for a night to remember. Dial up the fun at your romantic dinner with this playful appetizer. 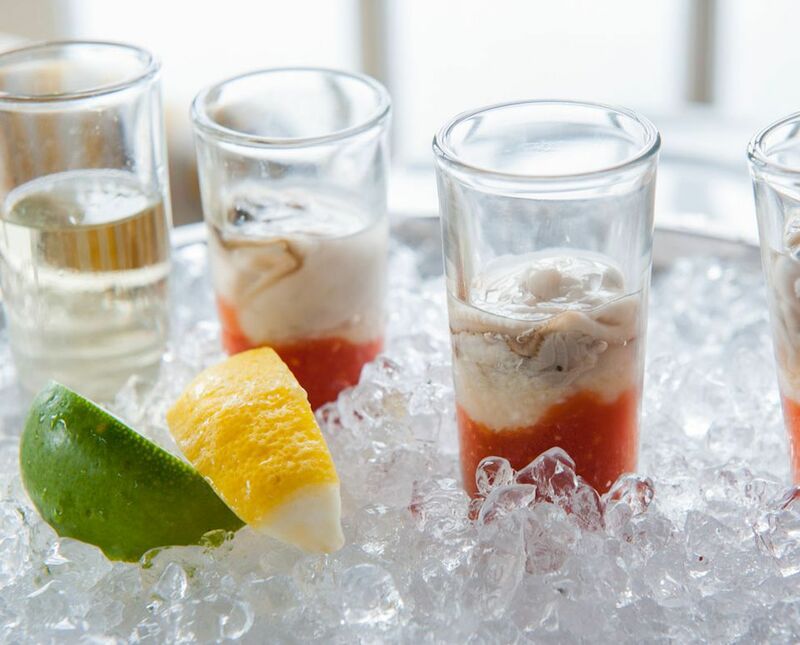 Raw oysters have long been considered an aphrodisiac and vodka is a sure way to kick start your Valentine's party for two. If you plan to shuck your own oysters, be sure to you know what you're doing. If you like your oysters deep-fried, this appetizer is sure to please. Crunchy golden brown fritters with chopped oysters inside deliver huge flavor. To form the round shape, use a cookie scoop to drop the batter into the frying pan. Serve this ceviche-style shrimp cocktail in martini glasses for a fancy presentation. Lightly-poached shrimp are marinated in fresh lime juice, tossed with cucumber, tomato, avocado, onion, and cilantro, and nestled into a tangy sauce spiked with Mexican flavors. Steamed mussels swimming in a fragrant basil coconut sauce make a divine main course for your romantic dinner for two. Be sure to serve it with biscuits or crusty bread for soaking up the gorgeous sauce. Tender sweet shrimp are cooked in an elegant butter, olive oil and fresh herb sauce. 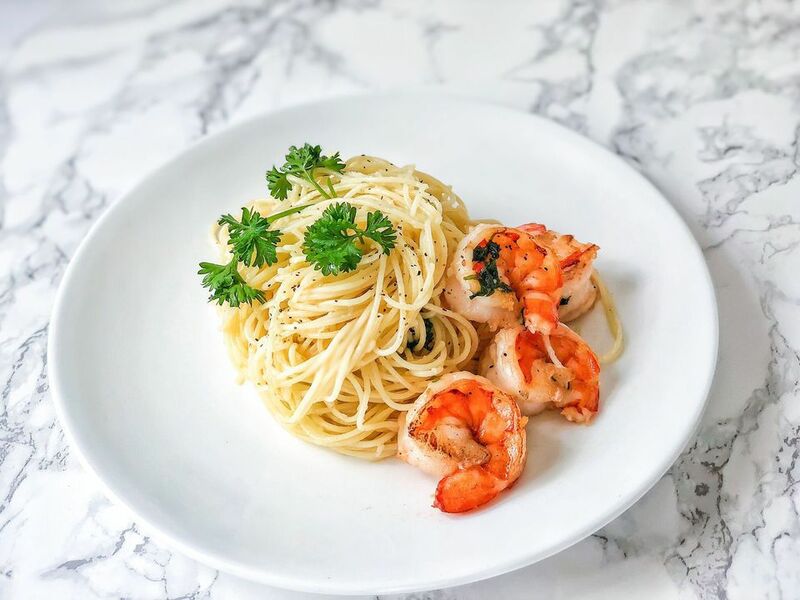 They're folded into hot cooked angel hair noodles and dressed up for the table with grated Parmesan cheese in this pretty pasta dish that makes a great Valentine's Day entree. In this elegant stuffed seafood dish, thin flounder fillets are rolled around a savory seasoned spinach mixture. A recipe for a lush, creamy white sauce is included and the fish is finished with a sprinkle of Parmesan cheese and paprika. Your romantic dinner guest is sure to swoon over this heavenly seafood pasta dish. Sweet and salty clams are steamed in a light broth of fresh tomatoes, onion, garlic, and white wine, then served with spaghetti or linguine pasta. Use fresh clams from the fish market for fantastic flavor and beautiful presentation. Add shrimp and scallops (or lobster) to your favorite pasta and pair with this cream-based, rich mushroom sauce with Parmesan cheese for a simple, intimate dinner for two. A true bisque (which requires seafood to be authentic), this easy-to-make soup combines crab and shrimp with sherry for a sweet, tasty meal. Pair with a nice crusty bread or salad for a complete meal that will impress your sweetheart. This classic seafood dish features chunks of tasty haddock baked in the oven with cheese and breadcrumbs. It takes a little time to bake, so open a bottle of white wine and entertain your dinner guest while you wait.